The compact Radius Jr. is best used for smaller spaces keeping supplies organized. 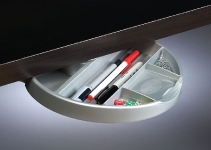 The sleek design rotates and stops in open and closed positions concealing contents from view. 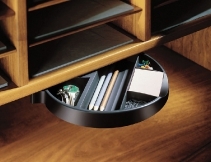 Simply push one end and the drawer rotates 180 degrees to allow access to commonly used items.